When I finished watching this movie, I felt as if I just completed a William Faulkner novel while Mulholland Drive was playing in the background. The movie is about nothing more than directing a film. In this case, it is some sort of science fiction odyssey. The type of film is unimportant. What this film is really about are the thoughts of the film’s director. I am absolutely positive that Federico Fellini is taking this opportunity to project all of his feelings and experiences on his protagonist. At other times I’m not sure. Consider a beautifully shot scene where the director is remembering an event in his childhood. He and some friends run away from their Catholic school in order to pay a prostitute to dance the Rumba. Evidently, the prostitute lives in an abandoned pill box on the beach. Even though this is a rather large, imposing woman, who lacks any conventional beauty, I got the feeling of sensuality in this scene. It was as if though the mysteries of sexuality where beginning to be unlocked, revealing a bridge between innocence and what was to come. Throughout the film, the director is constantly harassed by those around him. One man wants to know his views on Catholicism and Socialism. One woman, a columnist for a woman’s magazine in America, wants to know about his love life. A particularly needy actress corners him at every chance to question him about her role in the movie. The producer berates him about his intellectual naivety. The financiers of the film want immediate results. His mistress wants him to find her husband some work. His wife confronts him about his infidelity. The ultimate payoff is satisfying and is one you’ll have to discover for yourself. This film is more about images than ideas I think. And what wonderful images they are. The camera work is stunning. The cinematography is groundbreaking. 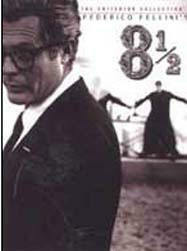 It is for these reasons 8 1/2 is such a great movie. I’m not really sure if the average film watcher would appreciate this movie. However, those who love art will certainly love 8 1/2.